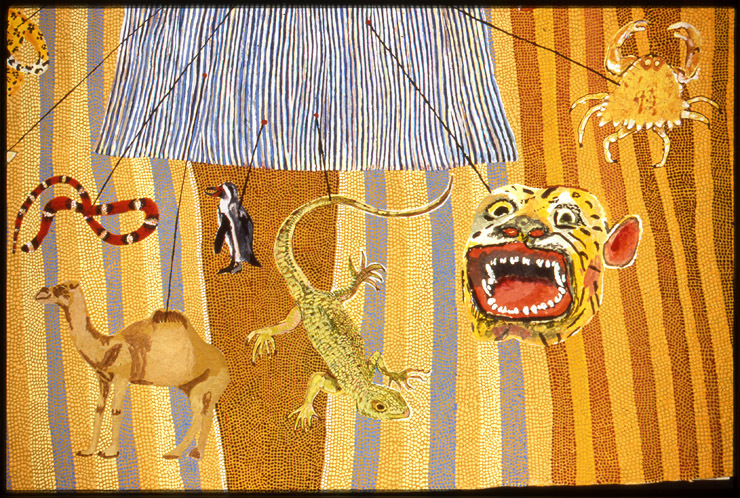 ¨Animal Kingdom¨, watercolor on paper, 27 in x 20 in, 1998. Detail from ¨Animal Kingdom¨, watercolor on paper, 1998. ¨Zodiac¨, watercolor on paper, 36 in diameter, 1998. Detail from ¨Zodiac¨, watercolor on paper, 1998. ¨Lexicon¨, watercolor on paper, 27 in x 48 in, 1998. Detail from ¨Lexicon¨, watercolor on paper, 1998. ¨Postcard¨, watercolor on paper, 27 in x 20 in, 1997. ¨Primer¨, watercolor and stitching on paper, 12 in x 8 in, 1996. ¨Gripping Beast¨, watercolor on paper, 14.5 in x 10 in, 1998. ¨The Days¨, watercolor on paper, 10 in x 14.5 in, 1996. Detail from ¨The Days¨, watercolor on paper, 1996. ¨Floating¨, watercolor, cloth, lace on paper with stitching, 11.5 in diameter, 1997. ¨A House Inside A House Inside A House...¨, watercolor on paper, 15.25 in x 15 in, 1996. 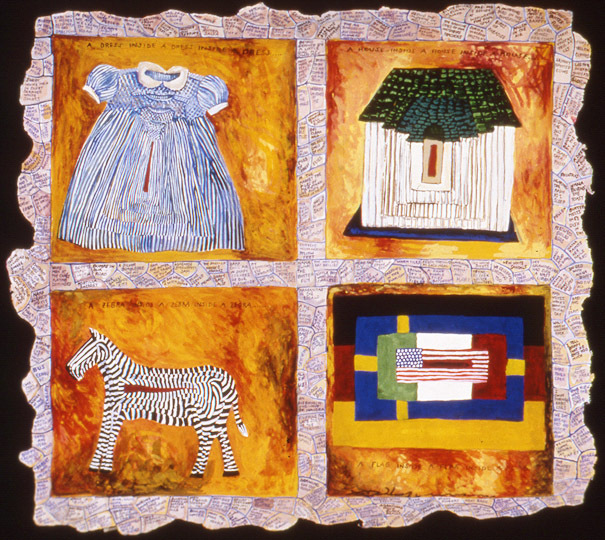 ¨Blackboard¨, watercolor on paper with fabric and stitching, 27 in x 20 in, 1997. Detail from ¨Blackboard¨, watercolor on paper with fabric and stitching, 1997. ¨Study For two Dresses¨, watercolor on paper, 5.5 in x 7 in, 1996. ¨Primer II¨, watercolor on paper, 8 in x 10 in, 1996. ¨Dark Chain¨, watercolor on paper, 8.5 in x 7 in, 1996. 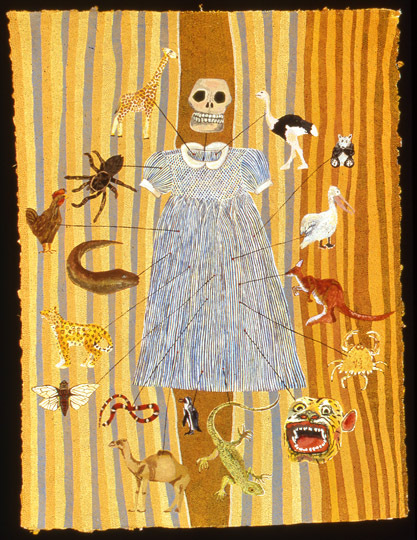 ¨Forgetfulness¨, watercolor, stitching and fabric on paper, 16.25 in x 5.5 in, 1998. ¨Liar¨, watercolor and stitching on paper, 7 in x 5 in, 1996. The series From The Nursery takes as its theme recollections of a childhood spent in Mexico and in New York City. In its entirety, it is composed of twenty-five works on paper. These works speak of the brutality and enchantment that can coexist within a family. They use the historical facts of genocide and dislocation as menacing presences, hovering in the background of the child’s consciousness, always perceived but never directly addressed.